No, not Christmas (not yet! 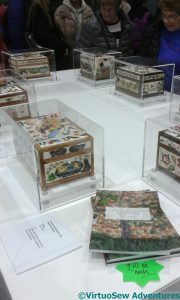 ), but the Knitting and Stitching Show in Harrogate. This is my best chance to stock up on the obscure, the intriguing, or the plain difficult to find. It’s also a good chance to meet up with old friends (it was lovely to see Elizabeth again), and sometimes even to make new ones. This year, as well as some sock yarn and some tangled reel ends of silk (which are a very useful source of odd colours for odd purposes, often in quite fine thread, which might be hard to find), I spent some considerable time looking at, and finally ordering, a new worklight, which I hope will extend my working hours on those days when I can settle to it. I also bought a couple of books, one on needlelace, which at the moment I have no particular reason for, except that I want, one of these days, to write up my Grandmama’s needlelace tablecloth. 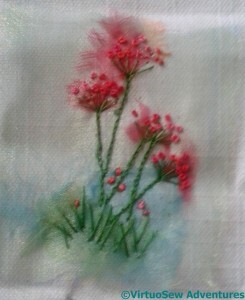 I’m sure I will find something I want to work in needlelace. The other is a book of crocheted hats. Something different to do, as a change of pace! The most important purchases, however, were made at Golden Hinde. 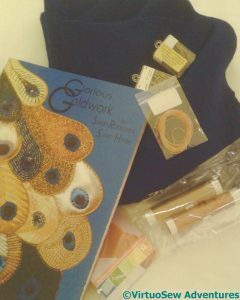 The Akhenaten embroidery is going to involve a good many materials and techniques I am only vaguely acquainted with. So I took with me the pricking for Akhenaten, so I could show the sizes and shapes I was trying to fill, and describe what I was trying to achieve. 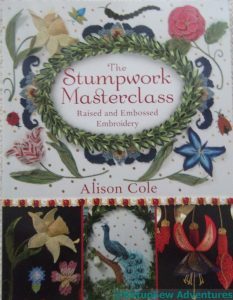 Soon a torrent of purls, twists, and silver plate were tumbling into my basket, accompanied by much advice from Sarah and Sue. I’m still wondering whether I will succeed with this one, but I’m looking forward to the challenge! 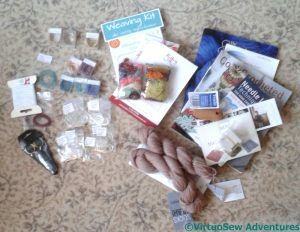 The Knitting and Stitching Show in Harrogate is my main opportunity to stock up on thread, fabric, materials and oddities. Yes, I know we all buy online these days, but so often I am looking for something slightly obscure, or I know what I want to achieve, but not how. The opportunity to look and feel before buying, and to talk to the specialist suppliers who are there, is absolutely invaluable. This time I was semi-organised, and as soon as I arrived, I went to Midori Matsushima’s stand with a shopping list of colours for the Faience Necklace designs, when I get to them. 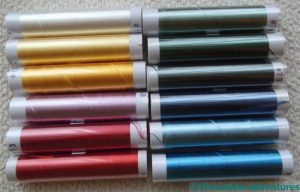 I’m hoping that now I have the silks I will have an incentive to pull my ideas into focus, because I feel that the Dreams of Amarna panels need more colour in them. This slightly less dense felt – some from 20th Century Yarns and some from Oliver Twists – is much easier to stitch than the dense felt sold to crafters which is stocked everywhere. I also like the somewhat rougher texture. 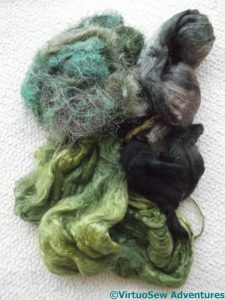 I went to a workshop introducing wet felting, which I am planning to use as the initial colour blocking for the “Vision of Placidus” panel, but what I actually bought was more silk to spin into thread for the second layer. I’ll have to wait until the sore elbow and shoulder have healed, but this is something I can do in preparation for the project while I’m still working on the Dreams of Amarna. I’m thinking about Placidus quite a lot in my odd moments! 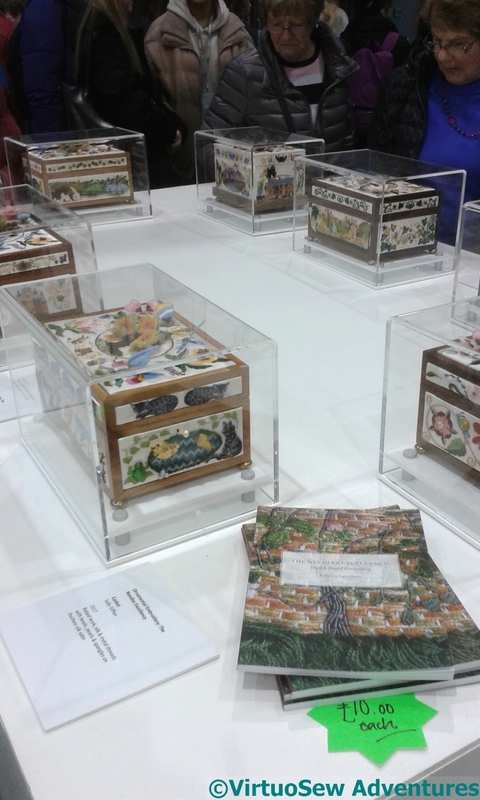 The Knitting and Stitching Show in Harrogate is always great fun, if totally shattering – imagine what it’s like for the stallholders, who get four days of it! 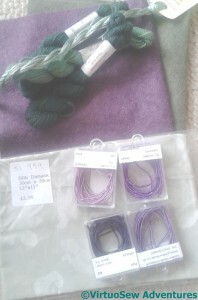 – but since I have no local needlework shop, it’s my one chance to stock up. 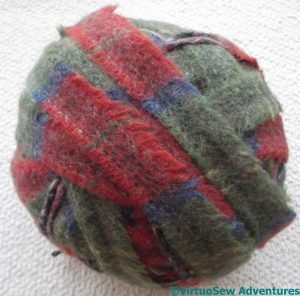 I admit that sometimes I don’t get around to all the projects I stock up for as quickly as I might like – I bought the threads for the Hittite Amulet at Harrogate in 2010! – but as we all know, sometimes a project undergoes considerable modification in the period from first concept to finished piece. 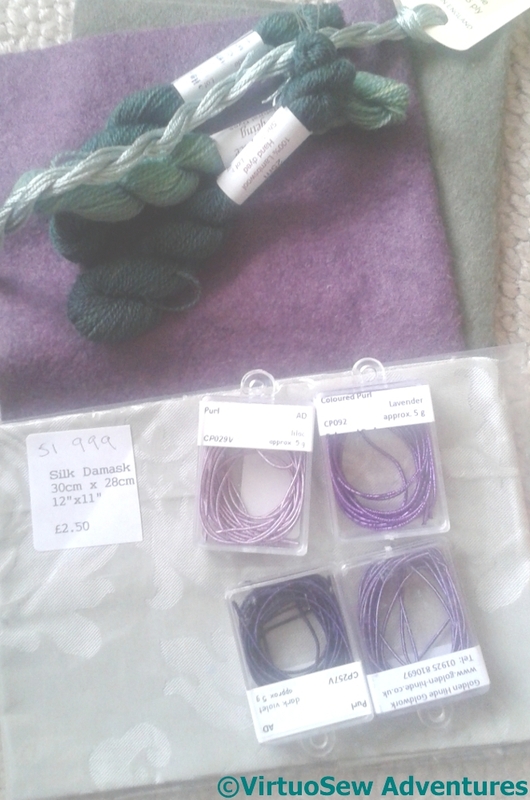 When I visited Elmsley Rose in the summer, she gave me some silk wrapped purl – three shades of purple. 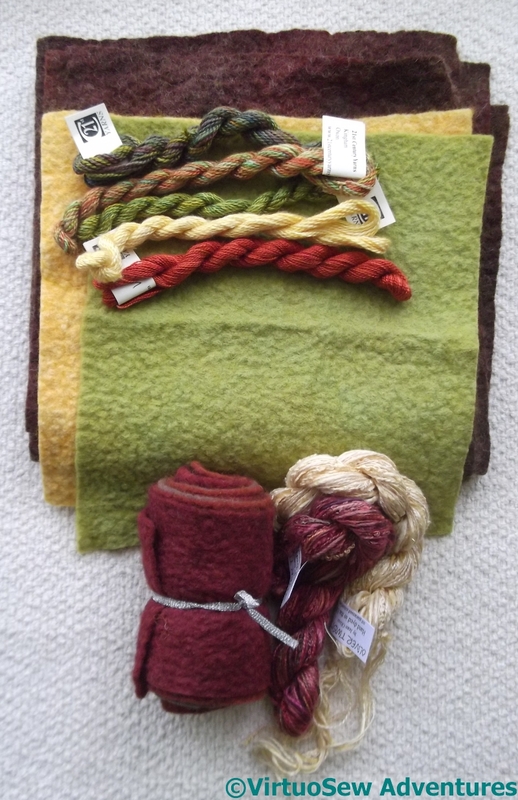 I’ve decided I want to work a thistle – more or less heraldic in style – so I’ve bought some wool felt, some coloured purl, and some lovely wool thread. Thank you to Lizzy Lansbury and to The Golden Hinde for comment, advice, and encouragement. The chance to talk to people with knowledge and experience is the real advantage of the Knitting and Stitching Show, after all. 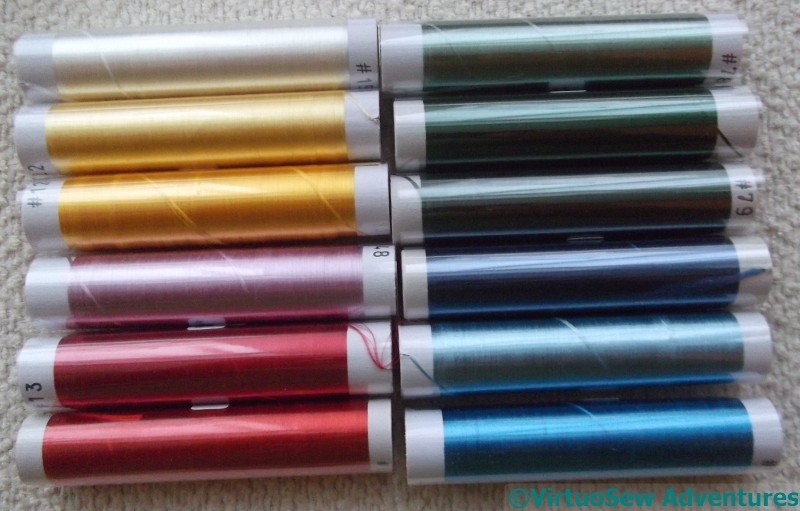 Even when I had a local embroidery shop, no-one who worked there had ever worked with metal threads, for instance! I usually wear my Autumn Leaves Skirt for the Show – what better time to wear it than among people who will enjoy it as much as I do! – but next year I may have another possibility. I’ve bought some lovely swatches of Donegal tweed to appliqué to a different skirt. The scatters of thread – wool, stranded cotton, and exotics – all come from my (extensive!) stash. My current thought is that the appliqué will be circles of different sizes. 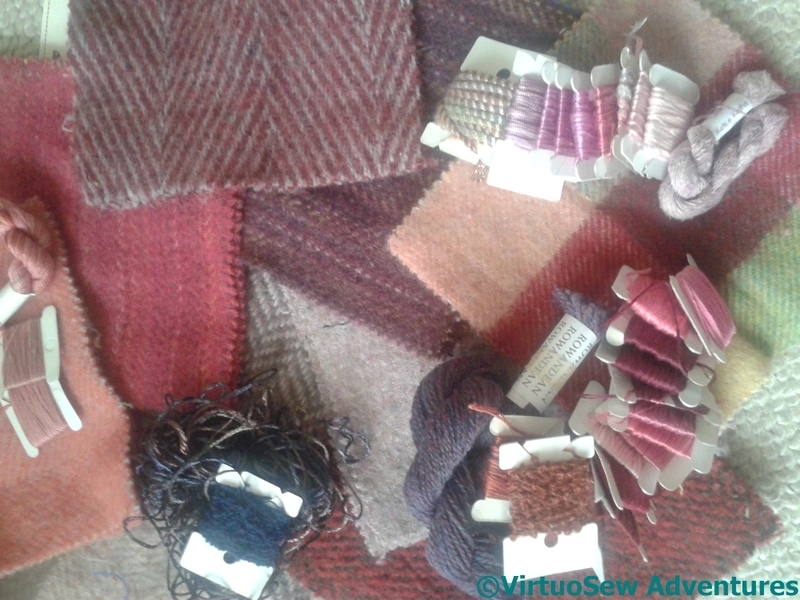 I only hope I bought enough tweed to do the job! And finally… I’ve known Ted and Katrina of Rowandean Embroidery, on and off, for about twenty years, since the days when I was making counted cross stitch kits. I’ve always admired the verve and invention of Katrina’s designs, and I love talking to them. But this is the first time I’ve been able to sit down with Katrina – I joined in on a Make and Take, playing with layers of sheers and a few bits of stranded cotton. It was a lovely break in all the trotting around of the show, to be able to sit down and stitch, instead of simply taking about it. And on top of all that, I had lunch with Elizabeth of Sew-In-Love, who is the fourth blogger I’ve met in real life this year. We had a lovely time, although, in what seems to be a pattern, I don’t think we spoke very much about embroidery!